That will be 1700kcal after an hypoglycaemic glucose of 2.0mmol/l or 1400kcal after a blood glucose of 4.5mmol/l. 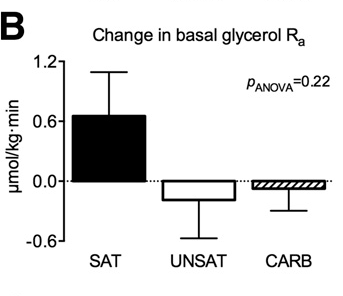 Glucose drop and kcal increase are both p less than 0.05. Next is this one, not quite so good because the title omits the word "insulin", but never mind. 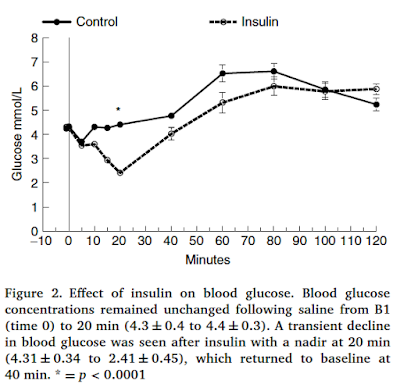 Here they infused insulin to a glucose nadir of 2.2mmol/l, stopped the insulin infusion and then infused glucose to normalise blood glucose concentration within 30 minutes. On one occasion the nadir was induced at the start of REM sleep (as early as possible in the night) and on another occasion it was induced about 3.5 hours later. Total sleep time was about six and a half hours on each occasion. At feeding time all of the subjects were normoglycaemic. The white column is the control, the hatched is from when the hypo was about six hours before feeding and black is from when the hypo was about three hours before feeding. 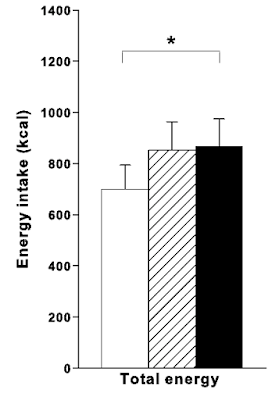 The conclusion is that an hypo soon before you eat makes you hungry (p less than 0.05). An hypo just after you have fallen asleep the evening before might do as well but the p value is ns for this test. In general we can say any hypo leaves you hungry. Hallschmid (second paper) is a dynamo of publications showing central insulin (via the intranasal route) is an appetite suppressor. You've noticed that this second paper did not have a group given insulin combined with intravenous glucose to protect against hypoglycaemia, isolating the effect of the insulin alone. But then we all know what that would have shown. Let's look at this from the real world point of view, which is: The function of insulin is the inhibition of lipolysis. What happened to FFA levels in either study? We'll never know. Many years ago I posted on a Spanish study cited by Dr Davis. It has all of the pictures you might need embedded in the post. 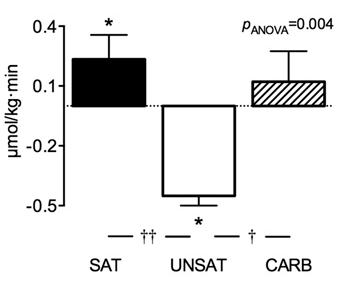 From this we can say that spiking your insulin by eating a small (40 gram) high carbohydrate snack will produce a rise in insulin from 50picomol/l (normal fasting) to around 70picomol/l (a little bit higher but not much, full post-prandial insulin would be at least several hundred picomol/l) at one hour, with return to 50picomol/l by two hours. 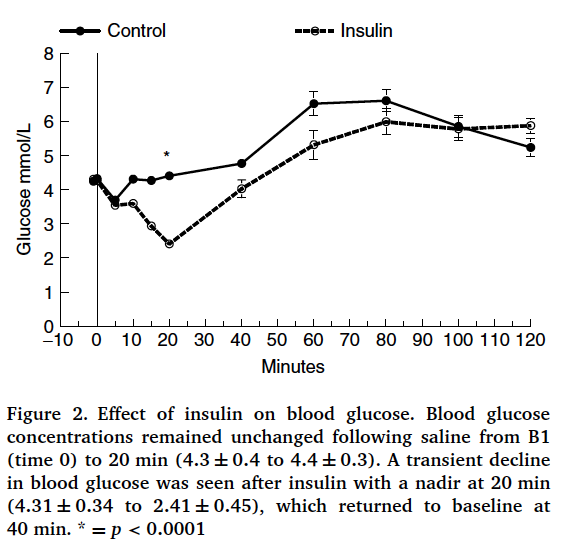 Despite this tiny rise in insulin the FFAs drop from over 400micromol/l to 100micromol/l at two hours (by which time insulin has actually normalised) with persistence of some degree of hypolipidaemia for up to another three more hours. 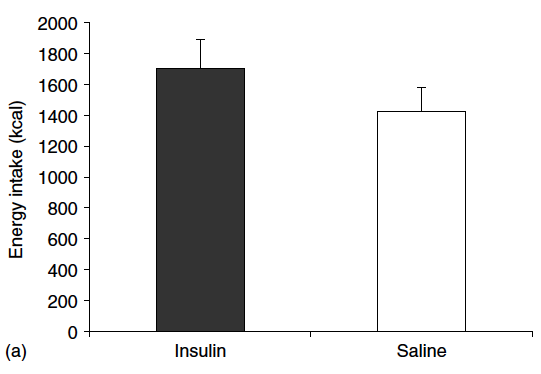 This is a tiny increment of insulin compared to the above studies. We know that hypoglycaemia without hyperinsulinaemia does not drive appetite. My hypothesis is that it's the insulin itself which drives a fall in FFAs, which in turn drives the hunger to rise, all secondary to insulin's anti-lipolytic effect. 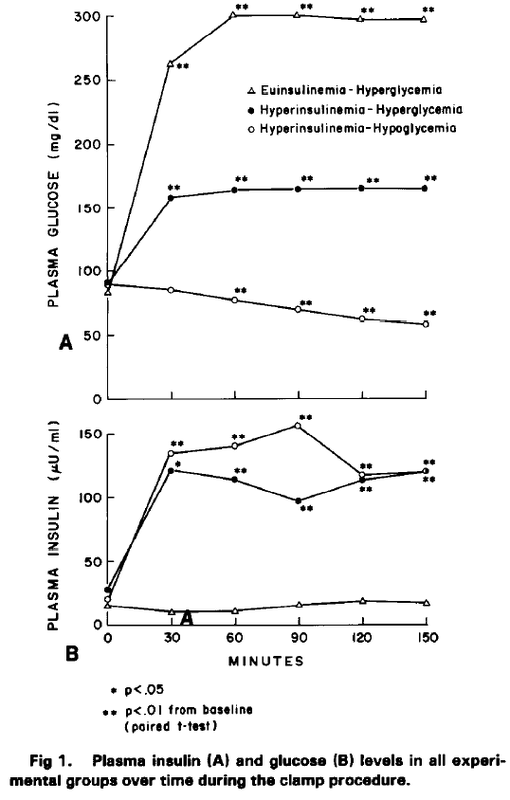 Note, there is no need for any direct appetite modulation from insulin to explain these results. So: you eat a Mars Bar at 15.30, just before evening consults ('cos you had a long theatre list, you had no lunch and there was nothing else to eat. Looong time ago, but I can still remember those days). By 17.30 you are ravenous and a bit shaky. Ha! Reactive hypoglycaemia! Oh, but your BG is 4.5mmol/l. Huh? TLDR: The function of insulin is the inhibition of lipolysis. Really. The hypoglycaemic group was excluded from the eating trial because they had had all sorts of things done to get stable hypoglycaemia with eu-insulinaemia which involved somatostatin/replacement insulin and so precluded feeding in the immediate post-clamp period. We just have to accept the subjective appetite ratings for this group. You would have thought that it would have been settled, back in 1985, that insulin in humans is an appetite stimulant. And that mild hypoglycaemia of 50mg/dl is not, provided there is no hyperinsulinaemia. Of course this is a simplistic interpretation and quite possibly incorrect. Let's have a look at it from a more metabolic perspective. The function of insulin is the inhibition of lipolysis. So if we look at this current paper in the light of the 2011 paper we can make a more insightful interpretation of what is happening. 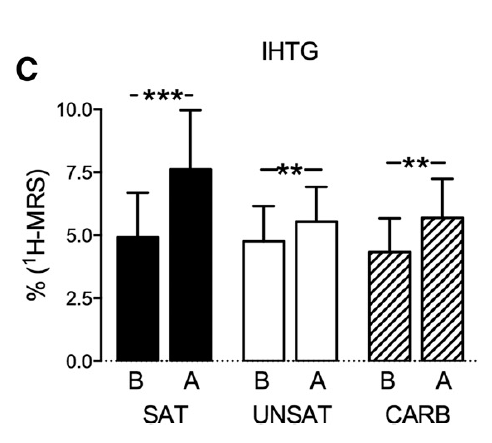 The people under hyperinsulinaemic clamps are not eating, because that is the study protocol. They are being infused with insulin at a time when they have no access either to any food or to their adipocyte lipid stores (and their hepatic glucose output will be near zero under the insulin clamp). 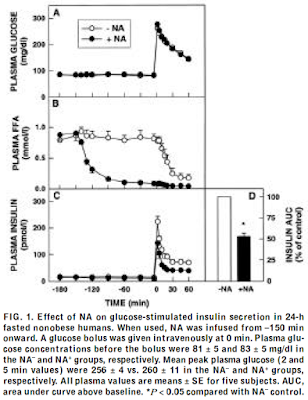 Even the people under an hyperglycaemic hyperinsulinaemic clamp, who received around 700kcal of glucose over 150 minutes, are losing much of this glucose in to glycogen stores while simultaneously being deprived of adipocyte sourced FFAs. The hunger may well come from metabolic energy deprivation rather than the insulin itself being an "hunger signal" of any sort. Insulin is the signal to store ingested calories. If it stores calories as if you have just had a meal when you haven't just had said meal, you are going to be hungry for those lost calories! TLDR: The function of insulin is the inhibition of lipolysis. In the brain. In the periphery. 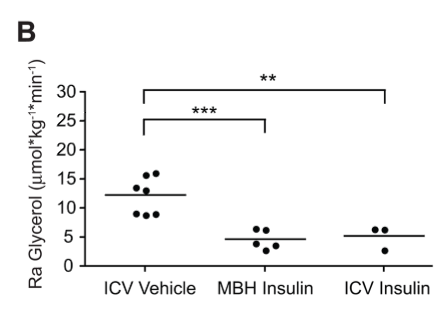 "To reduce the likelihood of pharmacological effects of the insulin doses administered, we choose a dose of insulin that is more than 15,000–fold lower than those commonly used for ICV [intra cerebro ventricular] insulin infusions (Air et al., 2002; Brief and Davis, 1984; Rahmouni et al., 2004)"
"An ICV (5 μl/h) or MBH [medial basal hypothalamus] (0.18 μl/h per side) infusion with either vehicle (artificial cerebrospinal fluid (aCSF) (Harvard Apparatus, Holliston, MA) or insulin (ICV 30μU; MBH 2 μU; Humulin R, Lilly) was started and maintained for 360 min"
"Both ICV and MBH insulin administration markedly suppressed the rate of appearance (Ra) of glycerol under basal and clamped conditions indicating that brain insulin, and more specifically MBH insulin signaling, suppresses lipolysis (Figs. 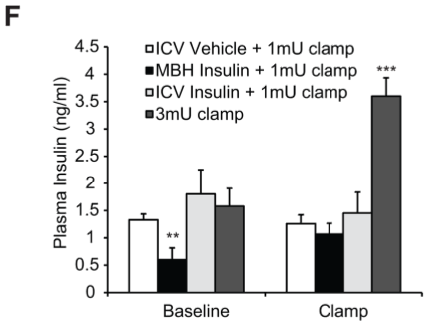 1B and C)"
"Hyperinsulinemia [systemic] induced by a 3 mU · kg−1 · min−1 clamp decreased the Ra glycerol by about 65% compared to a 1 mU · kg−1 · min−1 clamp in vehicle infused animals (Fig. 1C). 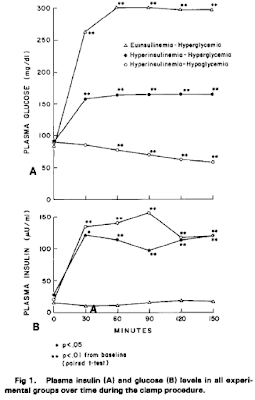 Thus, at the doses administered, brain insulin infusion inhibited lipolysis to a similar extent as that achieved with peripheral hyperinsulinemia"
The researchers didn't check the fall in FFAs from the peripheral 3mU/ml/kg clamp but I would expect it to be comparable to the central infusion level fall, glycerol appearance was equally suppressed by the central and peripheral administrations. So one question (among many) is: Does this fall in plasma FFA levels result in hunger? Oddly enough there are relatively few studies where humans have had experimental cannulae inserted in to either their cerebral ventricles or directly in to their ventomedial hypothalamus for insulin infusion. Ok, there are none. But there are plenty of studies where humans have had systemic hyperinsulinaemic euglycaemic clamps performed. What is rare is to ask what the effect of such a clamp might be on hunger. Which brings us to another gem of a paper, this one from Woo. And it's good. Woo had a bit of a rant about acipimox. Here's my simplified idea. I've been interested in acipimox, in a round about sort of a way, for a very long time. To me, the core fascination is that it is not only an effective suppressor of lipolysis, but it is pretty well weight-neutral and it most certainly does not result in weight gain. Which, you have to admit, is interesting. How can this be? I feel something of a clue can be found in the studies using a similar drug, nicotinic acid. Both drugs effectively suppress plasma free fatty acids via the same receptor but the neatest study happens use nicotinic acid. 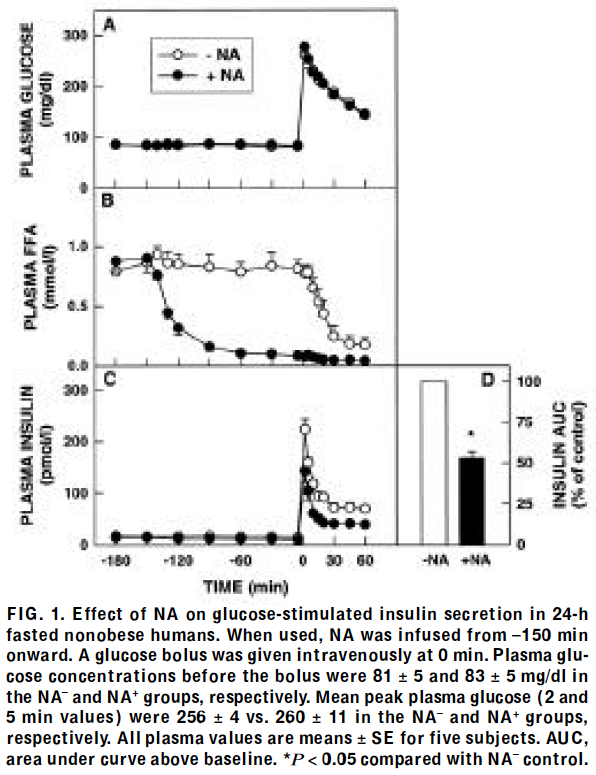 I think it is reasonable to state that dropping FFAs acutely, using nicotinic acid, results in a 50% drop in the area under the curve for insulin secretion over 60 minutes for a given bolus of glucose. 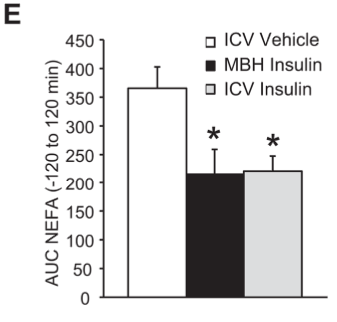 The more speculative idea is that dropping insulin might reduce lipid uptake in to adipocytes. I don't know. It's an interesting idea. If we simply consider acipimox to be a long acting analogue of nicotinic acid we have here a potential explanation for why it fails to induce weight gain. It might just simultaneously lower insulin levels. Understanding acipimox appears to require some insight in to the insulin hypothesis of obesity, not a notable feature in certain areas of obesity research. Failure to appreciate the roll of insulin in obesity will limit any sort of understanding of the condition or the drugs which might or might not influence it. Seems that way to me.